1. 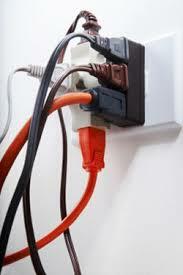 The misuse of extension cords is one of the most common causes of electrical fires? 2. All habitable rooms with walls of two feet or more must have a receptacle? 4. A non GFCI (ground fault circuit interrupter) receptacle must be installed for a refrigerator? 5. GFCI’s (ground fault circuit interrupters) should be tripped on a monthly basis to keep them in proper working order. Failure to trip them on a regular basis will result in ground fault circuit interrupters that will not function properly. 6. At least one receptacle is required to be installed in unfinished basements, all attached garages and detached garages with electrical power. 7. If a portion of a basement is finished, it must have at least one ground fault circuit interrupter?